9019-0001. Sterling Silver Souvenir Spoon Salt Lake City skyline. 9019-0002. Sterling Silver Souvenir Spoon Denver Colorado Capital. Hdle obv. embossed view of state Capital building + state seal + “Denver Colo.” on lower shank. MK: H.H. Tammen Curio Co.
Hdle rev. decorative edge scallops. 9019-0004. Sterling Silver Souvenir Spoon Toledo Court House Ohio. Hdle obv. embossed view of Ohio State Seal + embossed ram + eye + “Ohio” on shank. 9019-0005. Sterling Silver Souvenir Spoon Chicago New County Bldg., First National Bank, Fort Dearborn, Auditorium, Masonic Temple. Hdle obv. embossed view of: Chicago Seal + “New County Bldg”: + “First National Bank” + “Chicago” on lower shank + goldenrod (lower shank). Hdle rev. embossed view of “Fort Dearborn”: + “Auditorium” + “Masonic Temple” + stalk of grain. 9019-0006. Sterling Silver Souvenir Spoon Public Library Louisville, KY.
9019-0007. Sterling Silver Souvenir Spoon Wenatchee Washington Big Red Apple. Hdle obv. embossed view of George Washington at finial end + embossed view of sail boat on lake with Mt. Hood in distance ± logger chopping down a tall (redwood) tree ± flowers on lower shank. Hdle rev. embossed view of mountains in distance, landscape and horses + miner working in mine + prospecting equipment + fish on line + cab + starfish. 9019-0008. Sterling Silver Souvenir Spoon Sterling Silver Souvenir Spoon Lakefront Chicago, Illinois. 9019-0009. Sterling Silver Souvenir Spoon Niagara Falls Indian. Hdle obv. embossed view of “Niagara” Falls + Niagara Gorge. Hdle rev. embossed view of Indian with hand on forehead holding bow & arrows, Quiver = on Indian’s back. 9019-0010. Sterling Silver Souvenir Spoon Palace Hotel Shandaken New York. Hdle obv. Shepard’s Pattern handle #52. 9019-0011. Sterling Silver Souvenir Spoon Woolworth Building, New York. Hdle obv. cut-out finial with embossed view of “Woolworth Bldg.” + “New York” on lower shank. 9019-0012. 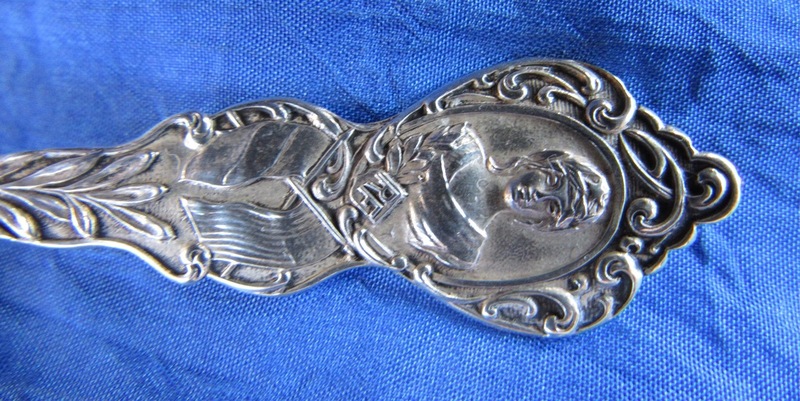 Sterling Silver Souvenir Spoon Roma Wolf SPQR. Hdle obv. FF view of Wolf at the finial suckling Romulus & Remus + “SPQR” below + decorative shank. Stamped: 800 + 800 (stamped twice). Hdle obv. Whiting’s Pattern “Madame Jumel” — Patented 1908. 9019-0014. Sterling Silver Souvenir Spoon Pennsylvania. Hdle obv. embossed "Pittsburgh" city seal + twist hdle w/ keystone w/ "Penn" framed by two fleur de lys at bowl. BL: emb vw of crown + "Fort Pitt" + emb vw of blockhouse + "1764." MK: Gorham (but not stamped Gorham). Sterling. Retailer: E.P. Roberts & Sons. + Pat. 1891. 9019-0015. Sterling Silver Souvenir Spoon. Little Miss Muffett. Hdle obv. emb. floral Pattern hdle. [hdle = slight bends; but no damage]. BL: emb. view of "Little Miss Muffett." 9019-0016. Sterling Silver Souvenir Spoon Reed & Barton fork. Hdle obv. embossed daisy flower Harlequin Patent fork. Hdle obv. Paye & Baker’s Marlboro Pattern hdle. BL: embossed view of “Water Tower. Riverhead, L.I.” (See. Zinn. Paye & Baker Catalog. p. 24 #6002. Bonbon bowl. 9019-0018. Sterling Silver Souvenir Spoon Rockefeller Center New York. 9019-0019. Sterling Silver Souvenir Citrus Spoon enameled flowers. Citrus bowl. w/ satin finish. 9019-0020. Sterling Silver Souvenir Spoon Pope Leo III St. Peter’s Square. Hdle obv. embossed cross at finial + frontal portrait of Pope Leo III in circular medallion + “”Leo PP III + papal regalia on lower shank. BL: embossed view of St. Peter’s and St. Peter’s Square. St. Peter's Square is a large plaza located directly in front of St. Peter's Basilica in the Vatican ... Gian Lorenzo Bernini designed the square almost 100 years later, including the massive Doric colonnades, four columns deep. 9019-0021. Sterling Silver Souvenir Spoon Charter Oak Connecticut. Retailer: Hansel, Sloan & Co.
9019-0022. Sterling Silver Souvenir Spoon Sterling Silver Souvenir Spoon Hôpital Français New York. Société Française de Bienfaisance. Hdle obv: embossed frontal view of woman (with laurel leaves in hair) + shield with letters "RF" [République Français] + two (2) flags – American & French + 1810 – 1910 on lower stem. BL: embossed view of multi-storied building with "Société Français de Bienfaisance" + "Hôpital Français. New York." MK: P&B [Paye & Baker]. Hdle obv: embossed profile bust portrait of "Vasco Nunez de Balboa" (facing left) + embossed view of ship + "Panama" on stem. Hdle obv: embossed frontal portrait of "Chief Seattle" at finial + totem pole on the stem. Hdle rev: embossed words" "Totem Pole Pioneer Square. Seattle Wash."
9019-0025. Sterling Silver Souvenir Spoon Washington White House, Congressional Library, Washington’s Home, Washington’s Tomb. Hdle obv. embossed view of “White House” + “Congressional Library” + “Washington Monument (on lower shank). Hdle rev. embossed view of “Washington’s Home” + “Washington’s Tomb” + “Washington DC” on lower reverse shank. Cost: $29.009019-0026. Sterling Silver Souvenir Spoon Mystic Shrine Pilgrim Camel Sword. Hdle obv. embossed FF view of camel at finial + Masonic saber with the words” “Mystic Shrine Pilgrim. BL: embossed view of Masonic Egyptian head + masonic star. 9019-0027. Sterling Silver Souvenir Spoon Peru Coin Bowl  with Llama at Finial. Hdle obv: embossed llama at the finial + filigree leaf fan + stem = twisted rope with flat edges attached = beautifully crafted. Bowl obv: embossed real coin bowl. Inscription: "Repub. Peruana Lima 9 D. Fino Y.B. 1907." With shield in center with llama + tree + cornucopia. From coin book about this coin: The obverse is emblazoned with the coat of arms of Peru, which is represented with Peruvian symbols, such as the national animal of Peru, the llama-like Vicuña (the South American version of a camel). To the right is the Peruvian national tree (a quina tree), and below is a cornucopia overflowing with coins, symbolizing Peru’s great wealth of precious metals. On the outer periphery are the words "REPUBLICA PERUANA" and "LIMA" (for the Lima Mint). Bowl Reverse: embossed real coin. From coin book about this coin: The reverse features a seated Lady Liberty holding a scepter topped by a Liberty Cap and a shield emblazoned with a radiant sun. In front of Liberty is a column topped with a wreath and wrapped with a ribbon on which is written the word “LIBERTAD”. On the upper outer periphery is the motto "FIRME Y FELIZ POR LA UNION" or "Steady and happy for the union". On the lower outer periphery is the denomination " 5' De SOL". 9019-0028. Sterling Silver Souvenir Spoon Pittsburg. Fort Pitt. Hdle obv. emb. view of deer with antler + water falls + bear + gun on lower stem. BL: emb. view of "Fort Pitt. Pittsburg, PA."
9019-0029. Sterling Silver Souvenir Enamel Spoon Bremen Germany. Hdle obv: enameled view of Central Square in "Bremen" Germany [on white enameled plinth below] with fountain in the foreground. Blue enamel handle [minor chips in some of the square blue enamels on the handle]. Hdle rev: Blue enamel handle on reverse [minor chips in some of the square blue enamels on the handle]. MK: "SCH&W" + 800 + crescent & crown + Musterbesch. 9019-0030. Sterling Silver Souvenir Spoon Fork Rothenburger Loffel town Mayor Germany. Hdle obv: Full Figure man at finial with arms that move up and down so the Mayor of the city can drink + "Rothenberger" on plinth _ decorative stem. For additional details about this spoon see Silver Magazine (April 1968) page 7. BL: embossed view of the Rothenberg Crest. MK: This spoon and fork were made by Claus Hinrichs [see original box].